This 30 minutes interactive procedure concerns a 68 years old male presenting bilateral venous ulcers. He has a long history of venous insufficiency with varicose veins surgery 44 years ago and bilateral Deep Vein Thrombosis 11 years ago. He presents actually bilateral iliac veins occlusion. Are chronic venous ulcers curable? How to approach bilateral vein occlusions. 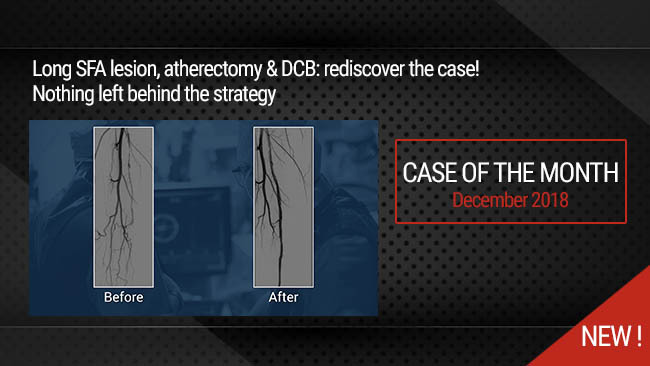 How to proceed to recanalize occluded iliac veins. How and where to stent residual vein stenosis. IVUS guided procedure to optimize evaluation and stent deployment. How to perform bilateral ilio-femoral veins stenting in the same session. Double right internal jugular vein access with two 10Fx23cm introducers. Crossing the Right and Left femoral veins occlusions using Hydrophilic wires and Triforce support catheter. IVUS run for landing zone assessment and sizing. Multilevel predilatation of the right and left systems. Simultaneous Kissing Stenting of the left and the right common iliac veins toward inferior vena cava respecting renal veins origin. Optimizing stent deployment and kissing balloon. Stenting of the left common femoral and external iliac veins with Venovo self-expanding stent and balloon optimizing. Stenting of the right common femoral and iliac veins with overlapping : Venovo and Vici self-expanding stents. Stenting of the left common iliac vein with overlapping stent. Authors:van Vuuren TM, van Laanen JHH, de Geus M, Nelemans PJ, de Graaf R, Wittens CHA. Authors:van Vuuren TMAJ, Doganci S, Wittens CHA. Authors:Jalaie H, Schleimer K, Barbati ME, Gombert A, Grommes J, de Wolf MA, de Graaf R, Wittens CH. Publication: 2016;21(Suppl 2):37-44. Epub 2016 Jul 12.